...that the Precursors were the only race to surpass the Forerunner in technological advancement? Installation 07, also known as Zeta Halo, is one of the seven rings in the Halo Array, located in the Sagittarius Arm of the Milky Way galaxy. Unlike the other six remaining Halo installations, which were constructed as a separate array of rings with the diameter of 10,000 kilometers, Installation 07 is the only surviving ring from the original main array of twelve 30,000-kilometer-wide Halos. However, the installation's diameter was reduced to 10,000 kilometers after most of its superstructure was discarded as a result of heavy damage. Unlike the other six rings in the final Halo Array, Installation 07 was manufactured at the greater Ark instead of Installation 00 or the "lesser Ark". As a result, it was originally three times the size of a normal Halo ring (30,000 kilometers in diameter). Like the other Halos, Installation 07 served a secondary purpose as a Lifeworker preserve for biological specimens from across the galaxy as part of the Conservation Measure. Installation 07 was primarily dedicated to humans, being home to various species and subspecies of the human genus, alongside numerous fauna and flora. The humans living on the installation identified themselves as Tudejsa, meaning "the People" or "People from Here". In the beginning, these humans were allowed to build their own societies and were mostly left undisturbed by the Forerunners. Some of the People even constructed rudimentary cities. During the Forerunner-Flood war, Master Builder Faber placed Installation 07, along with the other eleven rings in the original Array, under control of the Contender-class AI Mendicant Bias, and one of the primary extensions of the AI was placed on the ring. At one point, the Master Builder broke his deal with the Librarian and began to use the human specimens on the ring for his brutal experiments on the Flood. Some of the Lifeworkers serving on the installation complied and aided Faber's minions in these experiments, while those most loyal to the Librarian worked to keep the installation's biological preserves intact. Faber also forcibly drafted Warrior-Servants as an additional security force for the installation. In their exhaustive experiments, the Master Builder's researchers found that the majority of humans were apparently immune to the Flood, which they believed to be a result of a "cure" developed by ancient humanity during the ancient human-Flood conflict. In reality, no cure ever existed and the humans' apparent immunity was the result of the Flood's ongoing strategy to target Forerunners only. Faber's researchers believed that a cure to the Flood might be found via extracting ancestral memory imprints from humans who carried the Librarian's special geas. Since the human specimens on the installation lacked these imprints, Faber ordered his forces to gather humans from the Librarian's special population on Earth and transplant them to Installation 07. This was against the instructions of the Librarian and the Ecumene Council, who deemed the presence of ancient human warriors on a Halo too great of a security risk. Consequently, both the installation's own human specimens and humans from Earth would be used in the Master Builder's experiments, in what the humans came to know as the "Palace of Pain"; however, the "palace" was not in fact a single location as the humans believed, but many Flood research facilities across the ring, most of them being re-purposed Lifeworker biological research stations. The Primordial and Mendicant Bias on Installation 07. Circa 97,495 BCE, around sixty years after Faber had begun his unsanctioned experiments, he charged Mendicant Bias with test-firing Installation 07 in Charum Hakkor's system. As an unprecedented side-effect of this firing, the Primordial, an entity that had been imprisoned on the planet for millennia–in fact a Gravemind left behind by the Precursors–was released from its near-impervious cell. The Primordial, or the Captive as it was known to the Forerunners, was then taken on the ring by order of the Master Builder. Lifeworkers in the employ of the Master Builder studied the creature, but remained unsure as to its true nature - while some believed it to be related to the Flood, others did not. Not trusting the Lifeworkers, Faber assigned Mendicant Bias to interrogate the Primordial, which, using its knowledge of the Precursors' plan and compelling arguments that the Forerunners' rule led to eternal stagnation, eventually managed to turn the AI against its Forerunner masters. The creature also managed to manipulate the Master Builder into complying it with its schemes; whether Faber was fully aware of the Primordial's goals, or simply an uninformed pawn, is unclear. The Primordial then took charge of operations on Installation 07, encouraging the Master Builder to continue his experiments on humans, apparently for no reason other than its own amusement. The Master Builder himself departed the installation shortly after the Primordial had been brought in, leaving his researchers in charge. Over time, Faber reduced the role of Lifeworkers on the installation, eventually confining them to smaller preserves with select groups of humans, while his minions continued their attempts to infect humans. As Faber's researchers took more and more humans from across the ring for their experiments, many human societies effectively collapsed; the People abandoned the cities out of fear that the Forerunners would come take them away, escaping to the wilderness. After Mendicant Bias had been subverted by the Primordial, the AI broke the safeguards in the ring's various Flood containment facilities, allowing the parasite to spread to various sections of the installation. The Flood devoured large areas of the Halo's artificial landscape, covering it with Flood biomass. As more and more Forerunners succumbed to the Flood across the installation, the Master Builder had a machine known as the Composer used to stave off the effects of Flood infection in a number of infected Forerunners. After Installation 07 had been officially considered missing for 43 years, the Master Builder had a second Halo ring transported to the primary San'Shyuum world Janjur Qom and authorized its activation to suppress a rebellion, wiping out all but few of the San'Shyuum. However, he failed to foresee the consequences of this decision. Immediately following the firing, many of the Warrior-Servants and Lifeworkers assigned to serve under Faber's Builder forces openly rebelled against the Master Builder, viewing his actions as a grave offense against the Mantle. This rebellion was, for the most part, violently suppressed by Faber's Builder Security forces and the remaining Warriors and Lifeworkers were given a choice to either serve Faber or be killed. Some chose to ally with the Master Builder while those loyal to the Council continued to resist, sabotaging power stations and other facilities in an attempt to cripple the installation from within. Once the news of Faber's use of a Halo installation against the San'Shyuum reached the Ecumene Council, Faber was arrested and put to trial on Maethrillian, the Forerunner capital world. The other eleven Halo rings were gathered in orbit over the Capital, while Installation 07 remained missing after the incident at Janjur Qom. During Faber's trial, Installation 07 appeared over Maethrillian. The rampant Mendicant Bias managed to subvert its other extensions on five of the remaining Halo rings, and cripple the capital's forces, while releasing the Master Builder from captivity. However, the emergent IsoDidact used a control code to temporarily stun Mendicant Bias, which allowed the Capital's defenses to respond to the attack and assault the Halos under Mendicant Bias' control. The capital's fleets opened fire on Installation 07, while the Halo's sentinels and the Master Builder's ships attempted to defend it. Many of the ships involved in the battle were destroyed and crashed across the ringworld. Despite the installation taking heavy damage, Mendicant Bias successfully activated the ring's main weapon at the conclusion of the battle, presumably wiping out all life in the Capital system. Following the battle at the capital, Installation 07 retreated into a slipspace portal, reappearing in a distant star system near the galaxy's edges. This was part of a security measure beyond Mendicant Bias' control—in order to prevent the ring from falling in the wrong hands, it had been programmed to enter a course which would result in a collision with a planet in several days. As the primary, automated control systems had been sabotaged, the Primordial and Mendicant Bias were unable to direct the Halo's movements. Instead, they began to gather humans in a last-ditch effort to use them to manually steer the ring away from its destructive course. After its successful retreat, Installation 07 began automated measures to repair the damage it had taken. Over the next few days, entire plates of the ring's superstructure were replaced and rebuilt. However, the installation was still low on power due to many of the power stations being down, and entire sections kept experiencing power outages. Meanwhile, the Halo's human and Forerunner occupants were caught amidst the chaos. Mendicant Bias used its all-encompassing control to corrupt most ancillas and Forerunner armors on the ring, turning the armors into death-traps for their wearers. This forced Forerunners on the installation to remove their armor in order to survive. The Lifeworker beacons across the installation, used to transmit orders to the local humans via their geas, were giving conflicting commands which kept changing as the various factions fought for control of the beacons. Similar beacons were used to transmit orders to Lifeworkers and their ancillas across the ring, and although they believed the orders came from the Librarian, there was no definite certainty of this. Acting under these orders, a Lifeworker known as Genemender Folder of Fortune extracted and stored the consciousnesses and ancient personality imprints of any humans he found, doing the same to himself, believing it would save him from having to serve the Master Builder. During the battle above the capital, two Earth humans, Chakas and Riser, who had been captured by Faber and were aboard ships headed to Installation 07, crashed in different parts of the ring. Chakas landed near a village, where a young woman known as Vinnevra found him and later took him to see her grandfather, Gamelpar, who had been brought on the ring from Earth by Faber's minions long ago. The group then proceeded to travel under the guidance of Vinnevra's geas, which had activated upon Chakas' arrival, but upon arriving at the destination, they discovered it to be a "Palace of Pain", where the Primordial itself and a number of war sphinxes were herding numerous humans inside. After traveling in the opposite direction for several days, the group reunited with Riser, who had landed in a Flood-infested region nearby. Eventually, they came across a rail transport which brought them to Lifeworker Central, where a monitor instructed them to enter another transport. The humans were then taken to the facility where Mendicant Bias' core was housed. There, humans from Earth were separated from the Tudejsa, and their ancestral personality imprints were removed by Mendicant Bias and the Primordial. They were given a choice to cooperate with Mendicant Bias and have their revenge against the Forerunners for destroying their civilization ten thousand years earlier; however, they would first have to help save the Halo from colliding with the approaching planet. Those who accepted Bias' offer were sent to various control stations spread out across the Halo, including the Cartographer. However, humans alone did not possess the knowledge necessary to properly interface with the ring; instead, Flood-infected Forerunners processed by the Composer were brought in and connected with each human to the Halo's control systems. As Installation 07 approached the planet, the controllers successfully managed to reorient the ring in a way the planet would pass through the center; this way, the ring would take heavy damage but had a chance of surviving. Despite this, there was still a grave risk that the gravitational pull of the planet would tear the Halo apart. Plates of foundation material were moved over the exterior walls in preparation for repairs during the passage. Sentinels and other craft were positioned across the Halo, firing their engines in an attempt to alter the installation's course, with little success. The Halo's central hard light hub and spokes, typically used in the activation process of the main weapon, were activated to slow down the ring's passage over the planet, and to borrow some of the planet's velocity in order to alter the ring's orbit in an effort to prevent collisions in possible future orbital passes. However, the hard-light structures did not last long against the planet's surface, disintegrating shortly after the impact. The installation's outer walls quickly exceeded their capacity to manage the strain of the planet's tidal stresses, coming apart at various points. As the walls gave way, the foundational plates began to bend and distort, with massive gaps–some of them hundreds of kilometers in diameter–opening between them. While the installation had already begun its passage, a fleet led by the IsoDidact appeared, and the Didact used his control codes to shut Mendicant Bias down. He immediately entered the Cartographer and connected to the installation's controls with Chakas, while dreadnoughts from the Didact's fleet moved to provide power via connections across the ring. Despite the additional power supply, the Halo could not be saved in its entirety. 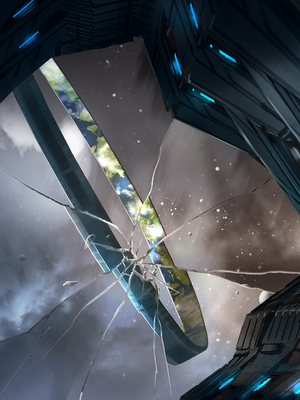 In order to relieve the tidal stresses exerted on the Halo, the Didact ordered that the installation be reduced by discarding the most damaged plates; this would also allow repairs to be made at the lesser Ark. To preserve the most important sections, they were locked into slipspace stasis, effectively rendering them invulnerable to damage from the outside. After the passage of the planet, the ring's central hub and spokes were activated to act as support braces for the intact sections while two-thirds of the superstructure was shed into space, contracting the Halo to a diameter of 10,000 kilometers. On its remaining power, the installation generated a slipspace portal and transitioned to the greater Ark. Installation 07 with the other six rings. At the conclusion of the Forerunner-Flood war, Installation 07 was activated along with the other six rings in the final Halo Array, wiping out all life within its effective radius of 25,000 light years. On November 3, 2552, during the Battle of Installation 05, a signal was sent to this Halo from Installation 05, putting the former—as well as the entire Array—on standby mode. Installation 07 was then ready to fire on demand. Later in 2552, during the Battle of Installation 00, Installation 07 was still on standby. However, SPARTAN John-117 deactivated the Halo Array before it could be fired, rendering Installation 07 inert. By analyzing the holographic data in the Ark's Citadel, the Office of Naval Intelligence deduced basic details about Installation 07, including its size and what appeared to be a cloud cover blanketing its surface. The supposedly cloud-covered surface led an ONI scientist to speculate on whether the ring's life support systems had never recovered from the damage it sustained 100,000 years prior. It later turned out that the hologram within the Citadel was out of date and the ring's automated systems had since managed to restore its Earth-like ecosystem. 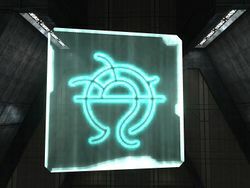 The symbol representing Installation 07. Because of its different origin from the other six Halos in the Array, Installation 07 exhibits conspicuous differences to the other extant rings despite now being the same size. These differences are apparent in the Halo's physical infrastructure and material composition, but also subtler aspects such as the architecture and aesthetics of its structures and technology or the machine language of its distributed computer systems. The depth of Installation 07's ground layer before the foundation material below, at least in some areas, is approximately 800-900 meters. As with the rest of the Halos, the upper layers of the plate foundation were shaped to accommodate the terrain formations that would be laid over them. During the skirmishes surrounding the Fate of Maethrillian, the terrain on the Halo was destroyed in many areas, leaving the bare foundation exposed. In addition, large gaps had been burned into the foundation itself during the battle around the Capital. Some of these damages was deemed extensive enough to remove and replace entire sections of the ring's foundational plate, with the Halo held together by its edge walls and possible field reinforcement during the operation. The replacement plates were moved from the Halo's exterior, transported over the inner portion of the ring and eventually placed in the missing sections. In less damaged areas, building up the foundation from within the ring's interior was sufficient for repairs. A ditch in the landscape, for example, would be closed by the foundation gradually rising from below. Entire complexes of structures—some of them thousands of meters tall—had been destroyed; due to the ring's limited power, their basic hard light frameworks would continue to flicker on and off erratically, attempting to rebuild themselves. "We feed the flies, the flies feed the bats and birds and the fish. It is the Lady's way." As a sanctuary of Lifeworker specimens like the rest of the Halos, Installation 07 was home to numerous transplanted species of flora and fauna from various worlds, including life native to Earth. These included bees, mosquitoes, rabbits, bats and edible scorpions larger than Chakas had seen in his home region of Marontik. Installation 07 had not been fully finished by the time of Chakas' journey there; when complete, it would have accommodated even more transplanted beings. Among its vast amount of different flora the ring was home to one peculiar type of enormous tree with thick thorns that made passage impossible in forests where the trees were thickly spaced. The trees' trunks were brown and green, and several meters thick. Ten or twelve meters up the thorns were supplanted by tiny branches that formed a dense canopy. Several hours before dawn, the spikes would withdraw into the trunks, allowing passage through the forest, thrusting out again at first light. A forest of these trees was traversed by Chakas, Vinnevra and Gamelpar during their journey on the ring; the trio made it out just in time before the dawn. On the other side of the forest there was a salty ocean spanning the width of the ring. The sea was home to massive aquatic creatures smooth and gray in general aspect with fins and rounded, blue and purple appendages edged with lobes branching off into sets of smaller and smaller lobes. The flesh that comprised the lobes resembled milky glass full of bubble-like jewels. They initially reminded Chakas of merse, another aquatic creature favored by the Librarian. These creatures observed Chakas, Vinnevra and Gamelpar for hours while they crossed the ocean in a wooden boat but did not attack. On the other side of the ocean was a dense, humid jungle with terrain that gradually rose from the shoreline into a plateau and a mountain range. This area was a Lifeworker special reserve and housed Genemender Folder of Fortune's station. Several hundred kilometers inland away from the mountains was a large region where terrain had been stripped away, leaving only bare foundation material for four or five thousand kilometers. This damaged portion terminated in an area covered in a thick coat of inert Flood spore powder generated by spore peaks that had formed there after a localized outbreak. The region was shrouded by a perpetual storm. Installation 07 was also home to a species of small, deer-like animal, a specimen of which was encountered by Dr. Mann and his research group in 2555. Shortly after completing its jump away from the Capital, the Halo's spin slowed down and the ring began to precess. While in the refuge system on its way to collide with the wolf-faced planet, Installation 07 still maintained a day-night cycle of sorts with a noticeable axial tilt relative to the local star. The Halo rotated in a way that the local sun would first fall behind one of the edge walls lining the band, then pass behind the other side of the ring, reappearing at dawn from the top of the opposite edge wall. Dawn was preceded by the illuminated portion of the ring's terrain growing closer further up the band while the shadow receded. The orange glow of dawn would be partly reflected to some areas still in the shadow of either the other side of the ring or the edge walls. At "noon", the sun would pass through the middle of the opposite side of the ring directly above the observer—termed the "sky bridge" by Chakas. To better grasp directions on the Halo, Chakas devised his own system of terms: inland or inward for away from the nearest edge wall and outland or outward toward the opposite wall. "East", he decided, was the direction of the local "sunrise" while west was where the sun "set". Meanwhile, the Tudejsa, who had acclimatized to life on the ring as opposed to Earth, used their own words to describe directions, including lightwise, crosswise and turnwise. Installation 07's primary mapping facility was an enormous structure extruding from one of the edge walls. The nexus of Lifeworker operations on the installation, Lifeworker Central was a large structure with a cavernous, dim interior built near a body of water with rocky cliffs several kilometers on the other side. Like many other locations on the ring, the hard light structures within—including walls, balconies, windows, roadways and walkways—were suffering frequent power outages and flickering uncontrollably. The Central was accessible via a rail transit system as well as anti-gravity gondolas on the waterfront, which housed a wide dock platform. After the crisis at the Capital, several of the boats at the dock had partially sunk. Known to the local humans collectively as the "Palace of Pain", these facilities were the thousands of former Lifeworker biological stations converted into Flood research centers by the Master Builder. In practice, they were under the administration of Mendicant Bias, working under the Primordial's instructions. One of these research facilities was an enormous square pillar leaning against one of the edge walls, its top obscured by clouds. The Primordial personally observed crowds of humans—made docile by controlling their geas via beacons—being herded into the structure by war sphinxes. The Lifeworkers maintained many outposts and reserves across the ring where they monitored and tended to the local life. Genemender Folder of Fortune's station was located in what appeared to be a primitive human village, the Forerunner technology of the outpost itself hidden by a dazzler or baffler. The huts in the village—including a central hall—were constructed of log, elevated above the ground by pillars and accessible via stairs or ladders. After the crisis on the ring escalated Genemender began to scan and archive the humans' minds, occasionally allowing them to simulate physical interaction in bodies of hard light. Hard light projectors were also used to maintain the village in a superficially pristine condition; in truth, however, the buildings had dilapidated considerably and the area had overgrown with tall grass. The interior of Genemender's station had a high, round ceiling and corridors branching off from the central chamber. The station also housed the machinery used for the mind-state scans; the archived human essences were stored in cylindrical Durances inside the station. The entire compound and the machines there were left inert after a power outage in the area. Beacons were ovoid-shaped devices found across the ring used by the Lifeworkers—or whoever controlled them—to give humans and other beings seemingly instinctive instructions through their geas. The ring was home to a number of power stations, many of which were sabotaged by the Warriors who rebelled against the Master Builder during the crisis at the Capital. A dark gray conical structure 300-400 meters tall was assumed to be a power station by Chakas, who had seen similar structures on Erde-Tyrene. The primary extension of Mendicant Bias was housed in a massive facility deep beneath Installation 07's surface, accessible via anti-gravity gondolas which traveled through an enormous, 20-30-kilometer-diameter circular opening in the ring's landscape. After passing through an undetermined void within the ring's bowels, the transit vehicles settled in an enormous chamber whose floor was a green-glowing maze of hard light paths resembling a spiderweb. Mendicant Bias itself was based in a mobile structure featuring its core crystals and a large green eye, moving on legs of hard light. It was here that the humans were eventually gathered and thoroughly examined by Mendicant Bias before the final effort to cancel the ring's failsafe orbit. After the installation's retake by the IsoDidact and Mendicant Bias' transfer away from the ring, the Primordial was detained in a chamber located near Mendicant Bias' former core, the metarch's data crystals now dark and inert. The Primordial was imprisoned in a hemispherical chamber 531 meters in diameter within an arena 104 meters wide, locked in a cage of intermeshed black rods housing a temporal manipulation mechanism. The cage was located on a round elevated platform in the center of the arena. A form of transport not observed on the other Halo installations, this form of conveyance consisted of high-speed cars hanging from a rail that floated in the air with no visible support. There were poles spaced at long intervals but the railing did not physically touch the pole, instead going through a wide circle on top of it. The cars were largely featureless on the inside and were capable of combining, reconfiguring and compartmentalizing their interiors to accommodate different passengers; after completing their journey Chakas and his human companions were shocked to learn that their car had been shared by Composer-processed Flood victims in a different compartment. The wagons were equipped with an ancilla who could provide refreshment—water and a nutritional paste—at the occupants' request. Like many other Forerunner installations, Installation 07 featured a unique type of anti-gravity gondola or "boat". Unlike many other gondolas which follow linear paths, these vehicles could traverse rather long and complicated routes, including one from Lifeworker Central to Mendicant Bias' core. The home village of Vinnevra and Gamelpar was located near one of the ring's edge walls. It was a collection of huts situated on a flat plain of dry grass and dirt several hundred meters from the tree line. There was also old Tudejsa city some distance inland from the village. The humans abandoned the settlement after the Forerunners began to abduct humans for experiments. The city reminded Chakas of Marontik, though he noted it may have been older and more populous. The city was lined by a large wall with mud and rock ramparts designed as a defense against raiders from other cities or roving bands. A single wooden gate on the western side allowed passage inside; the entrance tunnel was approximately 20 meters long. Much like Marontik, the city was home to motley stone and mud buildings with wooden supports no more than tree stories tall and with no particular concern for aesthetics. Cobble or dirt streets and alleys crisscrossed between the buildings. By the time Chakas, Vinnevra and Gamelpar visited the city, it had been raided of any valuables long prior. Likewise, the city was almost entirely devoid of life, including mosquitoes or waterborne larvae. The city's market was home to one of the Lifeworkers' beacons, camouflaged by Forerunner technology. About a kilometer off the shores of the ocean crossed by Chakas and his compatriots there was a human city based on wooden platforms supported by stone pillars and only accessible via water. A network of bridges, platforms, docks and other wooden structures crisscrossed between these pillars, becoming denser toward the settlement's center. The largest building had a layout the shape of a peaked pentagram and was home to a large hall with impressively intricate carvings in its door. During the skirmishes on the ring, this city was the site of a battle between hundreds of Forerunners whose corpses would remain scattered across the area; no humans—alive or dead—were present at this point. The Forerunners had imprisoned a proto-Gravemind in an energy cage placed inside the hall of the central building. The installation's surface, as portrayed in the Halo 3 texture, resembles Venus' surface. According to the Halo Encyclopedia, Installation 07 has a desert-like landscape and its surface is perpetually clouded. The UNSC science team's observations in Halo: Primordium corroborate this. However, in Halo: Hunters in the Dark, the ring's surface is described as having verdant forests and clear skies with no indication of an extensive cloud cover or desert-like environments. It was later clarified in Canon Fodder that the surface image on Installation 00 was outdated and the ring had repaired its environments. A holographic model of Installation 07 on the Ark. The surface of Installation 07 sometime before 2552. ↑ Though never officially stated, Installation 07's primary weapon was presumably upgraded at some point to become omnidirectional like those of the newer array rather than the unidirectional pulse it had as part of the older array. Otherwise, Installation 07 never could've acted as part of the newer array in an act of mass galactic sterilization. ↑ According to a statement by Catalog on the Halo Waypoint forums, the Swords of Sanghelios had implemented containment and sterilization protocols within possible Flood infected zones on the installation as of 2558; after the Swords of Sanghelios informed the UNSC of its containment efforts, human and Sangheili naval forces began monitoring the installation, ensuring the Flood did not escape. (Catalog Interaction, page 48) This statement is of dubious accuracy in light of information from Halo: Hunters in the Dark, which gives no indication of an ongoing Sangheili quarantine of Installation 07 as of 2555; instead, the Halo is depicted as having been discovered by the UNSC and remaining under ONI control, making the notion of the Swords informing the UNSC of their containment efforts distinctly out of place. Furthermore, no conspicuous Flood infection is described as being present on the installation in Hunters in the Dark. It is possible that Catalog's statement was instead meant to refer to Installation 05, which was known to be under quarantine by the Sangheili since the Great Schism, or was simply ignored and overridden during the writing process of Hunters in the Dark.